ERP vendors have made great promises about how their supplier portal modules will deliver compelling value and can be quickly deployed to their customers' raw material supply chain. They have over-promised and under-delivered. This frustration is among the top complaints and pain points of global manufacturing firms with a wide variety of suppliers, on multiple continents and in multiple languages. ERP vendors suggested they could handle all the supplier variables, communicating in real-time. To remain competitive in today's global marketplace, manufacturing firms must have all participants across their extended enterprise value chains acting in concert. To achieve this, there must a technology solution that enables real-time visibility, collaboration, execution and control over critical customer demand and supplier replenishment data regardless of the ERP system in use. For smaller manufacturers with a small number of plants and single ERP system, this requirement can be quickly and cost effectively addressed. 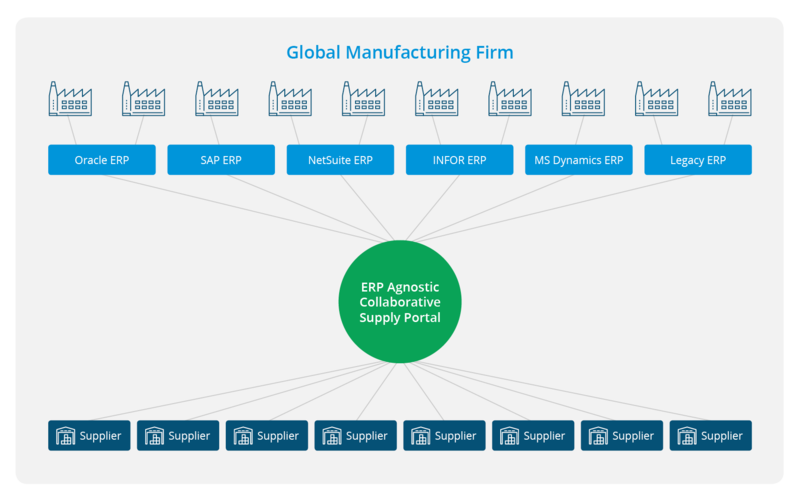 For global manufacturers with dozens to hundreds of plants and patch-work quilt of MRP and ERP systems, this is a massive undertaking. Realizing the folly of this kind of effort, CIOs will push for a new ERP system when all that was required is an MRP/ERP agnostic supplier portal solution. The combination of closed-loop supply chain processes, visibility to ALL orders linked to standardized demand signals, automated alerting tied to impending or actual supply chain disruptions allows material planners, buyers and suppliers to rapidly transition from reactive to proactive supply chain operations and responsive, nimble supply chains.